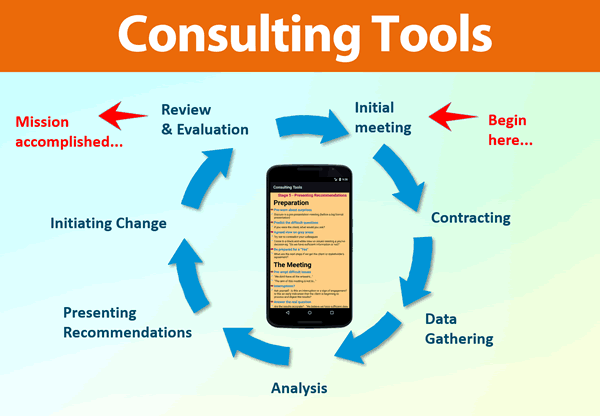 You can purchase our "Consulting Tools" app without attending one of our courses. This runs on phones and tablets using the "Android" operating system (which includes most phones and tablets except iPhones, iPads or Nokia). Get immediate access to tools, checklists and techniques to boost your performance as an internal specialist or external consultant. If you provide support or advice and guidance to business areas in your organisation or to external clients, this set of tools, checklists and guidelines will help you operate with greater confidence and achieve results more quickly and successfully. Be more effective in the end-to-end process of consulting! 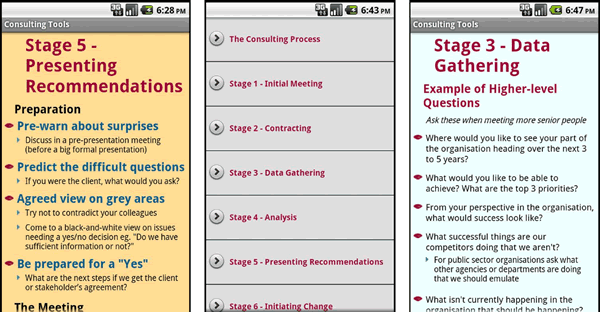 Load the app onto your phone to have consulting tools at your fingertips when you need them. Menu-driven for easy access to the right tools for the right occasion. 23 quick-reference screens to remind you of consulting techniques, detailed planning checklists and example questions to ensure your consulting initiative is a success. Which phones or tablets will the App run on? Press or select the "Google Play" icon on your phone (see example above). You should find this icon on your phone's main screen.